I don’t usually feature desserts that I haven’t tasted but I always liked Casellula (and their cheeses) and Elsewhere is from the same team. Also, I like the idea of someone suggesting we eat a cold dessert in response to twenty-one inches of snow instead of drinking gallons of hot chocolate. 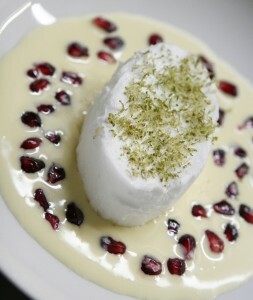 Created by pastry chef Leigh Friend, the Rose Snow ($8) is a frozen meringue on a pool of lime custard and pomegranate seeds then topped with curls of lime zest.